Kallari Sacha Guinya Bar, before and after. Kallari Sacha Guinya Bar...the makeover. We found the most bananas bar of them all: Kallari Sacha Guinya bar, the new recipe. Essentially, this is a chocolate banana bomb in your mouth experience. 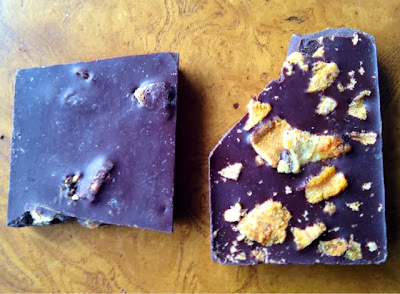 Last year's bar was mildly banana with the chewy dried pieces mixed into the chocolate (see the photo above). The new recipe puts the banana pieces directly on the back of the bar which creates a heavy banana punch the moment it hits your taste buds. Don't worry, the chocolate doesn't get lost in all of those bananas. A nice thick slab of Ecuadorian chocolate, strong enough to grab your attention yet a smooth melt, typical of Kallari. Your new chocolate banana friend, blissfully discovered. I love this job. *Becca from Kallari introduced me to this bar at the Portland Chocolate Fest, I don't want to wait until the next chocolate fest to find another. Question of the day....do you know where to find one of these bars? Comment if you do.